Hong Kong fun trip: Day 1, Day 2, Day 3, Day 4 and Day 5. Note: Post is overload with photos. We had our last yummy Hong Kong breakfast at Caritas Bianchi Lodge before proceeding to Kong Chung Ferry Terminal, Kowloon. We arrived at the terminal 8.30am but aiyo we can only get hold of 10.30am seats. That also is deluxe class ticket priced at HK$212 pax. All the early economy tickets (HK$137) had been sold out. Paying for deluxe class ticket means we’re sited on the upper deck, get free newspaper and brunch! 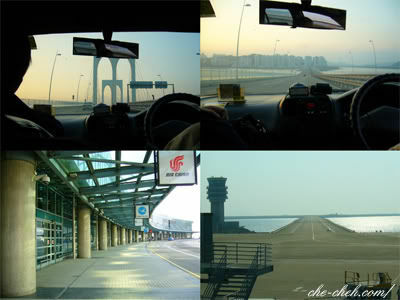 We reached Macau 1 hour later. This is Macau Ferry Terminal. Friendship Bridge which connects Macau and Taipa. We spent almost an hour at the terminal queuing for immigration. I tell ya, the whole terminal resonance like morning market! We met a lot of Chinese from China at the terminal. Some of them are quite rude and loud. We arrived at our hotel, Macau Master Hotel at noontime. Sorry no photo because this hotel is so yucky! They promised us room with triple beds but what did we get? double beds with 1 extra bed. We couldn’t add another bed. No problem then but they charged us triple beds pricing. And because of this I don’t encourage anyone to stay there. The place is so rundown (different from internet photos), room is small, staff is quite rude and the hotel has this ‘old’ stinky smell. I didn’t make any complaint as we will be spending one very short night there. After a short rest, we begin our walking route to Ruins of St. Paul’s Church. This is our lunch. Mee hoon dishes: not our cup of tea. 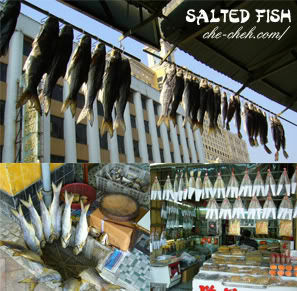 Hmm perhaps Macau people don’t like salty food. 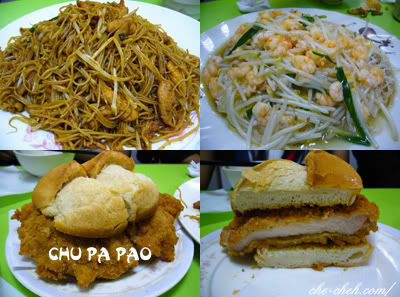 The Chu Pa Pao (pork burger) is yummy. 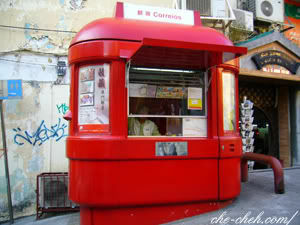 You can use HK dollar in Macau. HK$1 is approximately Macau $1 Pataca. Sometimes the shop in Macau will give you either HK$ or Pataca as change. Senado Square aka Largo do Senado. Just follow this colorful road to Ruins of St. Paul’s Church. 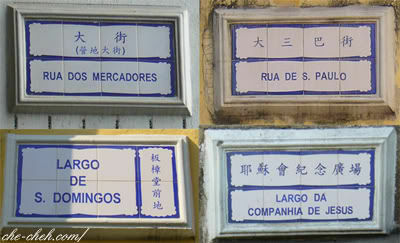 This is the side wall of Pharmacia Popular; a pharmacy right at the heart of Senado Square. Pretty yeah? I love old buildings. Arggh didn’t know that was a post office until I came back. St. Dominic’s Church; built by the Dominicans in the 1950s. 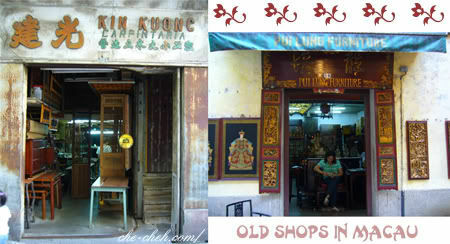 These old shops still stands proudly today. Amazing isn’t it? What are all these? They’re road signs and places name. Very unique! After about 40 minutes walk, we reached our final destination: Ruins of St. Paul’s Church. Believe me 40 mins is NOT long because you’ll be busy looking around, absorbing the Portuguese and Macaunese culture and heritage. Completed in 1602, St. Paul Church was destroyed in a 1835 fire. 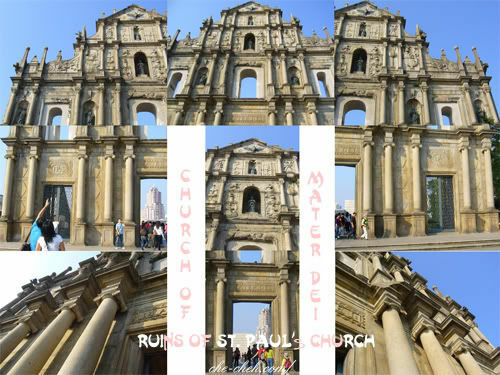 Only the main facade remain standing and it is known to the world as Ruins of St. Paul’s Church (Church of Mater Dei). 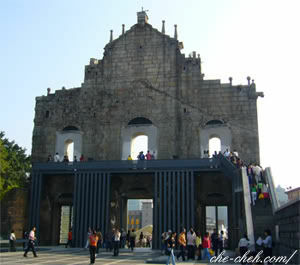 The beauty of Ruins of St. Paul Church. This is the back view of the ruins. Yes you can climb on the metal pathway. 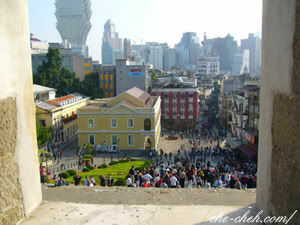 And this is the view that will greet you “Welcome to Old Macau”. Notice those tall modern buildings in the background. Oh yeah it is slowly swallowing old Macau. Behind this ruins, it is home to a museum where you’ll find crypts and archaeological sites. 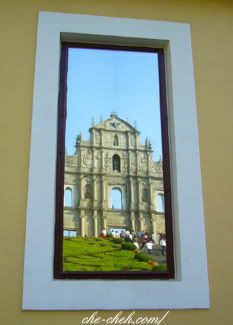 Just before leaving, I caught sight of Ruins of St. Paul’s image on the window of a building opposite this historic site. Pretty. At the foothill of this ruins you’ll find a post office kiosk. Haha what else? We sent a few postcards home. On our walk back from Ruins of St. Paul to our fugly hotel, we stopped by 2 pastelarias; Choi Heung Yin Bakery and Pastelaria Koi Kei. Two items that you must try from these shops are the almond cookies and phoenix egg rolls with seaweed and shredded pork jerky. 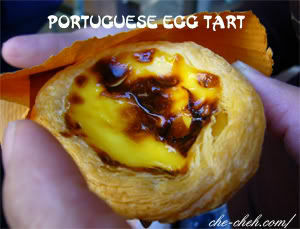 Portuguese egg tart from Choi Heung Yin. Taste like ours. From my research, the creator of the real Portuguese egg tart is situated at Coloane called Lord Stow’s bakery. Too bad we don’t have spare time to visit that shop. When in Macau, you must try Portuguese food. And that’s what we had for our dinner. 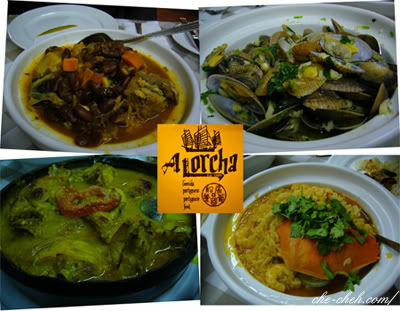 A Lorcha is a highly recommended Portuguese restaurant situated at Rua Do Almirante Sergio. The place is already buzzing with customer at 6.30pm (opening time). I suggest you make a booking if you’re planning to dine there. Our slurrppyyy… yummy… oh la-lala… mouth-watering dinner. Remember must try ar! Sorry the photos are quite dark but I assure you the food is to die for!!! Ameijoas Bulhao Pato – Portuguese clams prepared in garlic and olive oil. Galinha Poitou – chicken and potatoes in some sort of Kurma. After dinner, we took taxi to The Venetian in Taipa. You can take The Venetian feeder bus if you’re leaving from Macau Maritime Terminal. 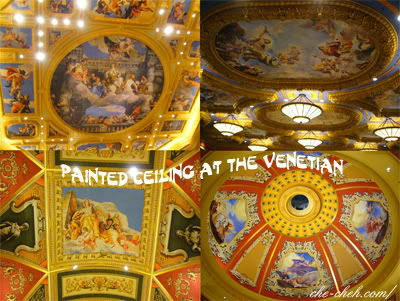 Beautiful painted ceilings at The Venetian. The Venetian was opened in August this year. This resort shopping area is themed after Venice. You’ll find the famous replica of the Grand Canal in Venice, St. Mark’s Square, the Rialto Bridge and beautiful decorated shop and painted clouds! Ohh you can even ride on the gondola and be accompanied by Italian opera singer. The singer’s voice is so good. 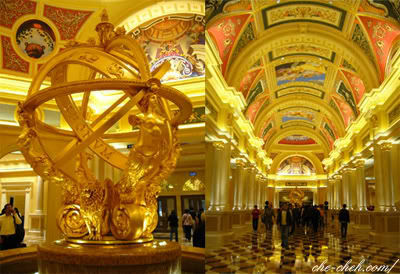 The Venetian casino is the largest in the world and hehehe I had the opportunity to look and play in this casino. Don’t have to guess la. I lost… &*#^[email protected] slot machines!!! Our ride to the airport at 7am the next morning. 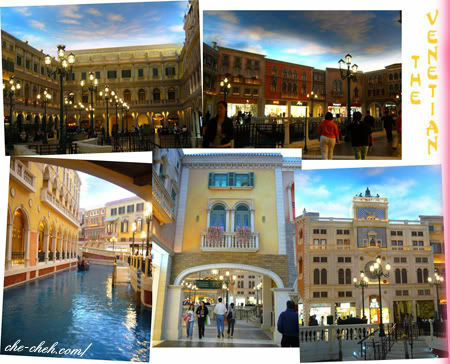 Btw, The Venetian is just a stone throw away from Macau International Airport. 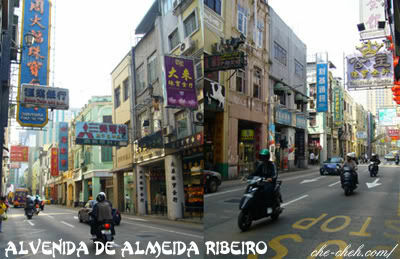 This is the end of my 2007 Hong Kong + Macau travelogue. I hope you enjoyed reading my travel experience as much as I’ve enjoyed bringing ‘em to you. Hope you like those photos that I’ve presented to you as well. I will definitely return to Hong Kong and Macau one day. I still have lots and lots of places, food and shopping to do you know? 6. 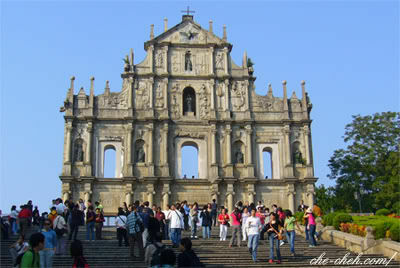 Macau Day 6 & 7: Ruins of St. Paul’s Church, Pastelaria, Portuguese Food, The Venetian & Goodbye! There’s a Lord Stowe’s in Causeway Bay … can’t believe you missed that one. 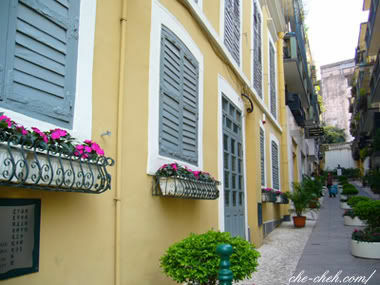 But Macau looks charming and small enough to explore in a short time ! Glad you had a good time ! 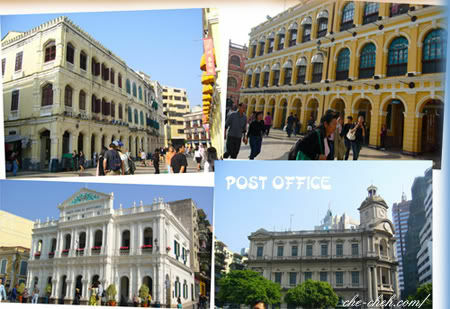 Wow, lovely Macau, those old buildings look great! wuah..its like watching the amazing race lidat but on che-cheh’s blog! …n u said ur photos are biasa?! believe me, they’re great mann! :whew: n the place looks good for a stroll. 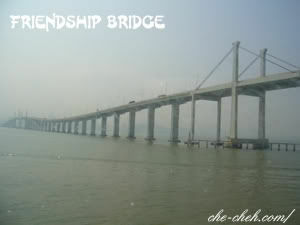 Such a nice name for the bridge.. friendship bridge. Why not show us the photos of the hotel.. next time I will take note not to stay at there ma.. 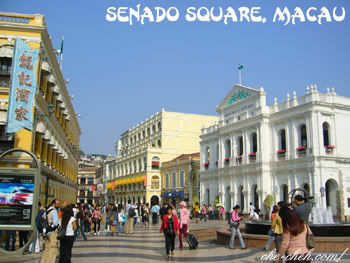 I hope next trip I am able to go Macau! de chupapao looks heavenly! 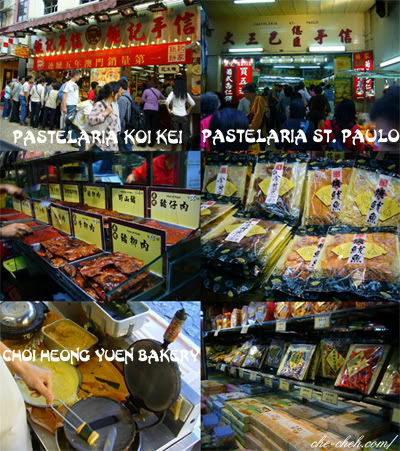 ahhh.. i misss hk for de food and shopping!!! Jam, yes nice place the Venetian. Thanks…I’m thankful. Dreamcatcher, thanks…yes the place is really nice especially at the old town area. Neo, hehe tag many so that can elevate more traffic lo. :tongue: Ohh i send the postcard to your home in Venice la. Keeyit, just remember the hotel name is Macau Master Hotel. Oh yeah…at first I didn’t give Ruins of St. Paul much thought but after looking at it with my own eyes at close proximity…I went Hulalal!!! You’ll love Macau and if you have free time try going to Zuhai(China) It’s just beside Macau and I heard the stuff there is down to earth cheap!! oh god, i remember the phoenix egg rolls… my mum that time bought so many back home. some more they were very yummy, so i really felt sayang wanna give them away to friends. hahaha. Narrowband, thank you. Yeah I write the whole travelogue here. Lazy to make scrapbook nowadays. Hcfoo, thank you. Glad you like it. Only dad won some $. yups. i enjoyed your travelogue. if you happen to go again, do remember to blog about it. Meiyi, thank you very much. 😀 I sure will.